It has been announced by the Technical Board of Education KPK that the Annual Exam Results 2013 of Diploma of Business Administration and in Diploma of Commerce declared. An estimated figure of the number of students appearing for the exam is 12401 and number of successful students are 7072 in the following programs, Office Secretarial, Accounts, Shorthand Groups, Banking and Short Hand Groups of Diploma in Commerce and the result percentage was 57.03 as per the statistics. Talking about the number of students who got registered for the Diploma in Business Administration was 933 while the number of successful students remained 459 as a result the passing percentage remained 49.20 percent. This entry was posted in BISE, Results on June 29, 2013 by Ilm Dunya. There has been an announcement by the Federal Board of Intermediate and Secondary Education Islamabad regarding the result announcement of SSC Annual Examination 2013 in which girls outshined the boys and got top four positions. The total number of students appeared for the SSC Annual Exams 2013 was 69136 while the number of successful candidates was 53967 which make the percentage to be 77.67. The girls dominated the science group whereas the result of the humanities group was dominated by the boys. Out of total 43849 students who appeared in the science group the number of students succeeded were 40728, the total students who appeared for the humanities group were 8344 out of which 6265 got successful. In the Science Group Abdul Wasay Ikhlaq of F.G Boys Public High School, Wah Cantt and Rehmeen Zahid of the Rangers Public School, Rahim Yar Khan took the first position jointly after getting 1026 marks, Noor Khalid and Mohammad Umer Arshad of Army Public School Rawalpindi took 2nd position jointly after taking 1025 Tooba Anwar and Sana Riaz of Army Public School and Fazaia Inter College Chaklala took 3rd position after taking 1024 marks. In the humanities group Ubaid Riaz and Muhammad Umair from Institute of Islamic Science took first and second positions after getting 938 and 926 marks. The third position was taken by Shareen Shafi with 924 marks who is the student of Al Amaal English School, UAE. This entry was posted in News on June 29, 2013 by Ilm Dunya. All the students who are searching for the dates and scores of the Scholastic Aptitude Test (SAT) are directed to view our page as we have provided the complete information about the SAT test and scores because our team knows the importance of this test for the students. In order to be eligible for getting admissions in the colleges of USA the SAT test is required. When a student attends his test and chose the right subjects and gets good marks in the selected subject then the departments of the college knows the interest of any student. The history tells that the SAT test was taken in 1926 for the first time and then a million of students opted this test for the continuation of their higher studies. The improved critical thinking skills are very important for the students wishing to appear for Scholastic Aptitude Test as this will help all the students for getting good marks in the SAT test. Some more information about SAT Test. As mentioned above the test has been divided in to three sections Writing, Reading and Mathematics. Islamabad, The admission office of Iqra University has started fall admission for the year 2013 at its Islamabad campus. The candidates can forward admission forms to the university till July 03, 2013 and they will have to appear in the entry test on July 06, 2013. The University has started admission process in the departments of Computing and Technology programs, Electrical Engineering, Social Sciences, Fashion & Design and Management Sciences in different programs. This entry was posted in Admissions on June 28, 2013 by admin. 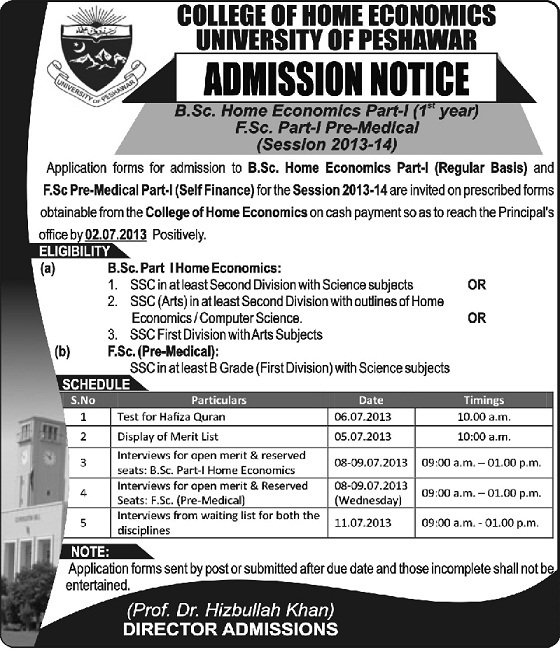 Peshawar, College of Home Economics, University of Peshawar has admission process in the discipline of Home Economics for BSc programs Part 1 (First Year) and FSc (Pre-Medical) part 1 for the session of 2013-14. The candidates should report to the department of Home Economics and obtain the admission forms with prospectus on cash payment & submit the admission forms for BSc Home Economics Part 1 and FSc Pre-Medical Part 1 (Self Finance) for the session of 2013-14. The candidates should forward their admission forms to the students till July 02, 2013. The candidates can apply for admission in the BSc Home Economics if they have passed their SSC exams with second division in science or arts subjects or with the subjects of Home Economics or computer Sciences. The eligibility criteria for grant of admission in the FSc Pre-Medical, is Matric with science first division or minimum B grade. The applications receive late or incomplete, will not be considered for admission. There has been a decision from the Academic Council of Agricultural University Faisalabad regarding the introduction of more than 15 new programs in the University. These new programs will be started by the Agricultural University with a view to face the challenges of the present market. The new programs include, MSC Food Safety and Quality Control, MSC Food Operational Management, MSC Mathematics, MA English, MA Sociology, MA Economics, BBA and Associate Degree Program, BSC Energy System Engineering, PhD Ecology, BS Bio Informatics, PhD Physics, BSC Environmental Sciences and BSC Genetics as per the announcement made by the Vice Chancellor of the Agricultural University Faisalabad Professor Dr. Iqrar Ahmed Khan in 273rd session of the Educational Institution. Two more additional programs are decided to offer because of the psychological interests of the Students which are, Neuro Cagnetor Research Centre and Bio Medical Sciences. This entry was posted in Universities on June 28, 2013 by admin. There has been an announcement by the Government College University Faisalabad regarding the issuance of admission schedule of all the candidates of colleges affiliated with GCU in the following fields, MA, MSc Part 1 and Part 2 Annual Examination 2013 and other announcements include, B.ED and M.ED Annual Examination 2013. There has been an announcement of the results of Second Annual Examination 2011 and First Annual Examination by the Islamia University which has been made available on result.pk for the convenience of the students. The number of students appearing for the Second Annual Examination 2011 was 3517 while the number of successful students was 1623, hence the result percentage remained 46.14%. The number of students appearing for the Second Annual Examination 2012 was 5318 and the number of successful students was 1800 hence the result percentage remained 33.85%. This entry was posted in Results on June 28, 2013 by admin. Federal Board of Intermediate and Secondary Education has announced the result of SSC Part 2 result for the year 2013 on Jun 27. The result of matric part 2 has been uploaded on this page for the convenience of the students. The board will also announced the top position holders of 10th class for the year 2013 at 050 pm. The students should visit this page again and again to get the complete updates for the annual exams of 10th class result. Congratulation to all successful students, who are now promoted to the next class. This entry was posted in BISE, Results on June 27, 2013 by Ilm Dunya. Board of Intermediate and Secondary Education, Islamabad has declared the result of SSC Part-II annual exams result for the year 2013 on June 27, 2013. The result of Matric class 10th has been uploaded on this page to facilitate the students. The students should keep in touch with this page to get the complete details of the result of SSC Part 2 for 2013. The successful students should be congratulated on their promotion to next class. The announcement of the top opposition holders will be made at 05 pm in the evening.